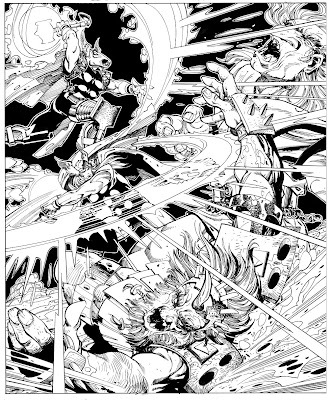 Here’s an amazing piece of artwork by Walt Simonson of Marvel Comics’ Beta Ray Bill and Thor mixing it up with some giants! Click on the image to view it larger! Happy Thor’s Day! Princess Witch Boy: Galaxy Runway Painting! Black Widow Ongoing Title Starts In April! This is an amazing piece! Thor Thursday is a bit redundant though, don’t ya think? It’d be cool to see something about Beta Ray Bill, I know I could just follow the wikipedia link but Storm > Wikipedia.